A lucky few individuals in every generation are granted with such extraordinary luck that even the gods are jealous of their fortune. Click here to play! Prepare to feel just a little bit of what that kind of power is like if you win the jackpot of the Double Magic 3-reel classic slots. 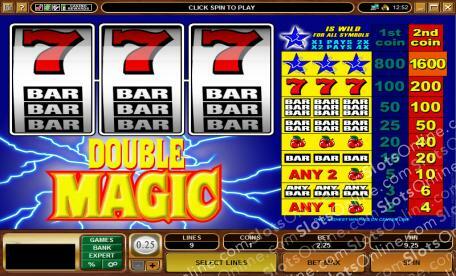 In this classic slots game, you must try to score all three Electric Double Magic Wild Stars on the payline at once. It's not easy, but many other prizes can be won along the way by collecting BAR symbols, lucky red 7s and delicious looking red cherries. If you want to play a classic slots game that makes you feel like one of the luckiest people on the planet, then try out the Double Magic slots and play two coins per spin. The 1600 coin jackpot is just waiting for a winner - a chosen one with the touch to conquer all of the Electric Double Magic Wild Stars. The Electric Double Magic Wild Stars are the wild symbol in this game. They substitute for any other symbol, and increase prize payouts when substituting. When 1 wild symbol substitutes, the payout is doubled. When 2 wild symbols substitute, the payout is quadrupled.